Polk County High's Senior and Junior teams display their team T-shirts sponsored by Polk County Soil and Water. Once again, Polk County FFA Chapter Land Judging Teams have made history and earned recognition for Polk County High School. For the third straight year, the FFA Senior Team earned a trip to the National Land and Range Competition held in Oklahoma City. 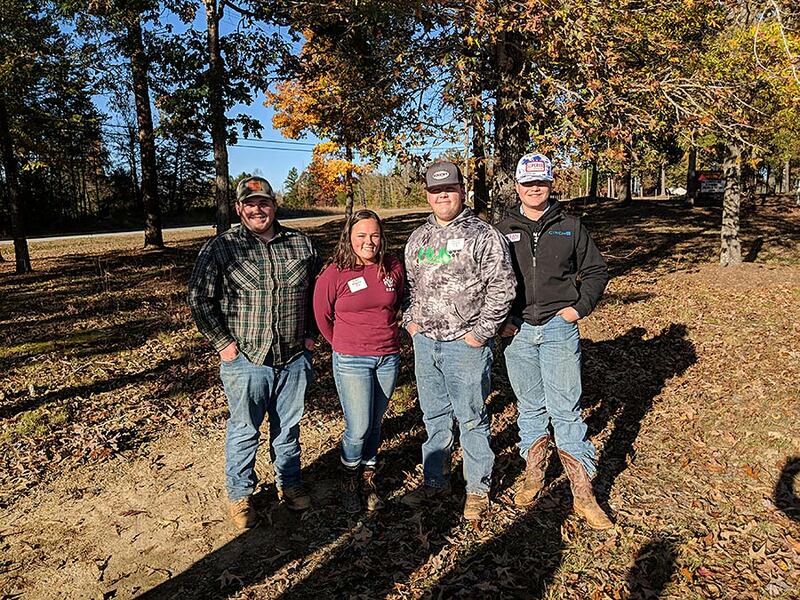 The team placed fourth at the 65th Annual North Carolina FFA Association Land Judging Career Development Event, held in mid-November in Guilford County. The national competition will be held in May. “We always want to win state, but our number one goal is to try to get every kid who participates the chance to go to nationals,” said Polk County agricultural education teacher Chauncey Barber. “Just really proud and thankful to have great students and a lot of community support. 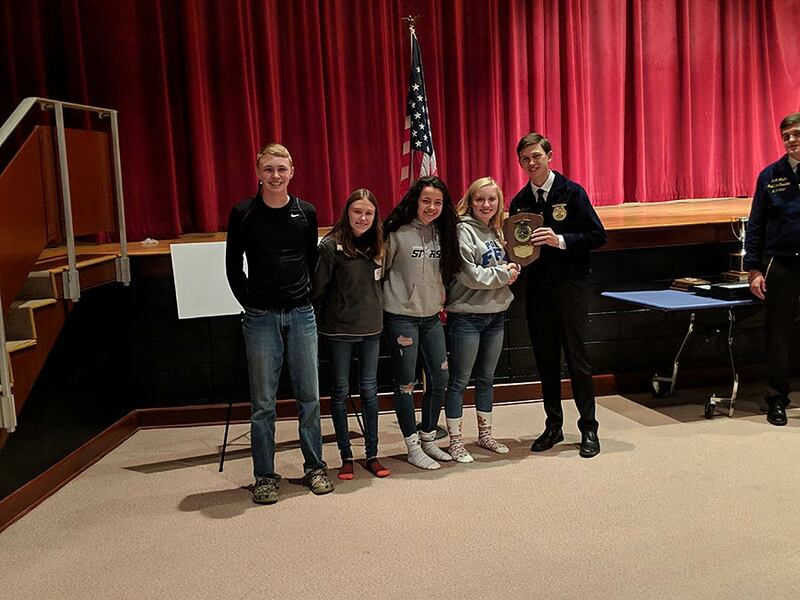 The Senior Team consisting of Mason Merrill, Karli Kilgore, Hunter Lynch and Wyatt Kay took first place honors in the federation, second in the Western Region and fourth in the state senior division. The Junior Team, consisting of Chan Barber, Lacey Gosnell, Katie Campuzano-Gomez and McKenna Hill placed first in the federation, Western Region and state junior division. Campuzano-Gomez and Hill tied for the second highest scoring individuals in the junior division. More than 40 teams competed in the competition. In early April 1955, 188 FFA members met on a parcel of land in Harnett County near Dunn where Interstate 95 was being constructed. It was on this site that the first “Soil Appreciation and Soil Judging School” was held. Sixty-four years later, hundreds of FFA members from across the state traveled to Guilford County to participate in the year’s 64th Annual North Carolina Land Judging Career Development Event. This event encourages students in grades 7-12 to analyze land characteristics such as soil type, erosion and drainage to determine the best possible use. Knowledge about soils can be organized and applied in managing farms, fields, and woodlands, developing communities as well as engineering work. Students are able to comprehend why soils respond differently to management practices and how soil properties affect crop growth and urban uses as well as environmental concerns. The North Carolina FFA is a youth organization of 19,301 student members preparing for leadership and careers in the science, business and technology of agriculture with 317 local chapters across the state. FFA makers a positive difference in the lives of students by developing their potential for premier leadership, personal growth and career success through agricultural education. Visit www.ncffa.org for more information. Anyone interested in helping sponsor the Polk County High School FFA Land Judging Team’s trip to Oklahoma can contact Chauncey Barber at (828) 894-2525 or cbarber@polkschools.org.